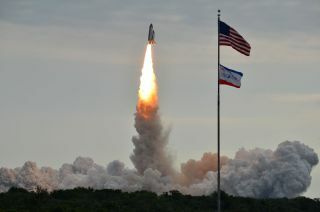 Space shuttle Endeavour lifts off at 8:56 a.m. EDT on May 16 on its final flight - STS-134. This story was updated at 12:24 p.m. EDT. CAPE CANAVERAL, Fla. — The space shuttle Endeavour, the youngest orbiter in NASA's fleet, soared into the morning sky Monday to begin the final mission of its 19-year career. Endeavour blazed a path through the sky here at the Kennedy Space Center at 8:56 a.m. EDT (1256 GMT), lifting off from the seaside Launch Pad 39A. "It was a fantastic launch, a really great day for us," shuttle mission management team chair Mike Moses said after the launch. "We're happy to be in orbit." "Looks like a great day to launch Endeavour for the final time," launch director Mike Leinbach told the crew as the minutes and seconds ticked down to liftoff. "On behalf of thousands of proud Americans who've been part of the journey, good luck, godspeed, see you back here on June 1." "As Americans, we endeavor to build a better life than the generation before and we endeavor to be a united nation," Kelly said in the final moments at the launch pad. "In these efforts we are often tested. It is in the DNA of our great country to reach for the stars and explore. We must not stop." The moment was bittersweet for the thousands of NASA workers who have devoted years to the maintenance of Endeavour and its two sister orbiters. After today, NASA has only one more shuttle mission planned before the shuttles are retired for good. "Endeavour has had a pretty amazing career," Kelly said after he and his crew arrived in Florida for a first launch attempt in April. "It's going to be Endeavour's 25th flight, and me and my crew are excited to be a part of it." That earlier launch try was called off when a heater used to protect a critical power unit on the shuttle failed just hours before liftoff. Engineers traced the problem back to a switchbox feeding power to the heater. They replaced the box and about 20 feet of wiring connected to it, and conducted thorough tests to make sure the problem was resolved. There were no issues with the system during today's launch countdown. Kelly is leading a veteran crew of six, including pilot Gregory H. Johnson and mission specialists Mike Fincke, Greg Chamitoff, Andrew Feustel, and European Space Agency astronaut Roberto Vittori. "I am really excited and charged up for this mission!" Johnson wrote on Twitter this morning. At 8:56 a.m. EDT on May 16, 2011, space shuttle Endeavour and its six-member crew lifted off Launch Pad 39A on a mission to the International Space Station. The launch was witnessed by a crowd of about 500,000 spectators, which included Kelly's wife, Congresswoman Gabrielle Giffords, D-Ariz. Giffords has been recovering in Houston after being shot in January during a community outreach event outside a Tucson, Ariz., grocery store. "On behalf of all of us, we all know Mark's been through a lot the past few months," Chamitoff said after the crew flew in to Kennedy Space Center last week. "He's done an incredible job keeping track of all the details of this mission. I flew with him on STS-124, he's truly an amazing commander, and all of us feel really, really lucky to have him guide us through this complex mission." Other notable attendees at the launch included astronaut Mike Collins, who flew on the first manned moon landing mission Apollo 11, five members of Congress, and officials from Italy, Japan, Ukraine, Israel and Bermuda. "We all have great anticipation for the amazing insights into the world and the universe around us that the AMS is going to provide," Fincke said after arriving in Florida last Thursday. "We feel that the AMS, along with the International Space Station, are great symbols of what we human beings across planet Earth can do when we work together constructively. Our crew is very proud to be part of this great endeavor." "Scientists have worked together for many years to make this day possible," said Michael Procario, acting associate director of the Office of High Energy Physics at the U.S. Department of Energy, which funded the U.S. contribution to the project. "Although it's been almost two decades in the making, the journey for the AMS experiment is just beginning." The six astronauts of Endeavour's STS-134 mission - the final flight of NASA's youngest orbiter - depart the Operations & Checkout building at NASA's Kennedy Space Center in Cape Canaveral, Fla. on May 16. The astronauts boarded the "Astro Van" at 5:11 a.m. EDT to journey to Endeavour's seaside Launch Pad 39A. In addition to the particle detector, Endeavour is carrying a platform filled with 14,000 pounds (6,350 kilograms) of backup supplies for the space station, which is scheduled to operate until at least 2020. The parts include a new tank of ammonia coolant, equipment for the station's Dextre robot, and spare parts for the laboratory's antenna communications system. "We have a lot of cargo transfer, important supplies, critical spares to deliver to the station," Chamitoff said. "All this is for the longevity of the station after the space shuttle program finishes." Chamitoff, Feustel and Fincke plan four spacewalks during their busy sojourn at the space station to stow the hardware on the outpost's exterior for safekeeping until it is needed. The mission will also involve complex robotic arm work to install AMS and relocate the supplies. The final planned space shuttle flight is the STS-135 voyage of Atlantis slated for sometime in July. Atlantis will take four astronauts to deliver one last haul of spare parts for the International Space Station. After their missions, Endeavour, Atlantis and their sister orbiter Discovery will be sent to museums for public display. Endeavour is promised to the California Science Center in Los Angeles, while Discovery will go to the Smithsonian National Air and Space Museum's Udvar-Hazy Center outside of Washington, D.C., and Atlantis will be displayed at Kennedy Space Center's Visitor Center. Without the space shuttles, NASA will pay for U.S. astronauts' passage to the space station aboard Russian spacecraft until an American alternative is available. The space agency has been working to spur development of U.S. commercial spaceships to carry crews. Meanwhile, NASA will work on building a heavy-lift rocket that could carry humans back to the moon, an asteroid, and eventually on to Mars.